The French midfielder says he is unsure about what the future holds. PAUL POGBA INSISTS he is unsure if he will remain at Manchester United beyond the January transfer window. Pogba was heavily linked with a move to Barcelona over the summer, with the France international reportedly at odds with Jose Mourinho. And the midfielder has now confirmed that he could yet be on his way out of the club in January, with Barca reportedly ready to pay up to £100 million for his services. My future is currently in Manchester, I still have a contract, I’m playing there at the moment, but who knows what will happen in the next few months,” he told Sky Germany. 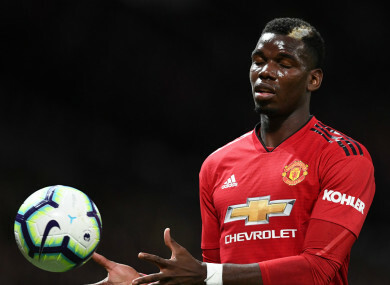 Pogba insists that he and Mourinho have a purely professional relationship, though he maintains that he will continue to give his all as United attempt to recapture their form and reel in early leaders Liverpool, whom they currently lie six points behind. We have a pure coach-player relationship, that’s right,” he added. The midfielder is currently on international duty with France and is primed to play a key role in Les Bleus’ Nations League fixture against Germany in Munich on Thursday, having stressed the importance for the World Cup winners to behave in an exemplary fashion as role models. On Sunday, the world champions will tackle the Netherlands. Mourinho’s side as a whole have come under fire this season, having won only two of their opening four Premier League fixtures. They will face Watford after the international break before a trip to play Young Boys in the Champions League. Email “'Who knows what will happen?' - Pogba not ruling out Man Utd exit in January”. Feedback on “'Who knows what will happen?' - Pogba not ruling out Man Utd exit in January”.